The sixteen prelates elected on Friday as members of the Ordinary Council of the General Secretariat of the Synod of Bishops — an influential group responsible for the preparation of the next synod — include some well-known names and a larger representation from Africa and Asia than in the past. The Register has learned the Council, whose total number of members has been enlarged from 15 to 21, includes eight from Africa, Asia and Latin America. Among those elected are Cardinals Joseph Tobin of Newark, despite not being present at this synod, Maung Bo of Yangon, Myanmar, and Bishop Andrew Nkea Fuanya of Mamfe, Cameroon — a rising star whose clear defense of the Church’s teaching during this synod has caught many people’s attention. The remaining six members who include papal appointees, experts and dicastery heads are not yet known. Vatican City, Oct 29, 2018 / 12:14 pm (CNA).- Among the most debated paragraphs of the final document from the Synod of Bishops on young people, faith, and vocational discernment were those pertaining to the concept of synodality. Although all paragraphs on the matter, namely, n. 119 to 125, got a majority of affirmative votes, the paragraphs also received a relatively high number of “no” votes, showing that bishops agreed less on that issue than on others in the document. This is not surprising. According to a source within the synod, the issue of synodality heated discussions as soon as the first draft of the final document was presented in the synod hall. Discussion swung between two poles. On one hand, some synod fathers wanted to include a strong word on synodality in the document, as part of an effort to lead the Church toward a new form of synodal-style government. On the other hand, some synod fathers objected to the idea that synodality as a way of governing might be pushed so far as to suggest that even doctrinal issues could be voted on by a college. It seems apparent that a clarification on the issue is needed, though it will likely not take place soon. First: it is not certain the pope will issue a post-synodal exhortation, as Pope Francis wants to evaluate the fruits of the document first. Vatican City, Oct 29, 2018 / 03:37 pm (CNA).- The fifteenth ordinary general session of the Synod of Bishops closed on Saturday. After a long afternoon of voting by the synod fathers, a final document was approved, mostly addressing the topics of young people, faith, and vocational discernment. Speaking to participants in the General Chapter of the Scalabrinians on Monday, Pope Francis calls on the missionaries to listen to migrants, to walk alongside them, and to share Jesus with them through the Word and the Eucharist. In his prepared remarks, Pope Francis invited the Scalabrinian Missionaries to help migrants remember both the good and bad moments of their lives and to preach the Gospel to them by their closeness. The Missionaries of Saint Charles Borromeo are holding their General Chapter in Rome on the theme: Encounter and Journey: “Jesus walked with them. (Lk 24:15)”. The Scalabrinians have sought to be “migrants with the migrants” for the last 25 years. Pope Francis reminded them to remain in Jesus and to live a healthy community life. Otherwise, he said, “we are only doing social activism”. In a message to Italian news agency SIR, Pope Francis calls on reporters to always speak the truth. Pope Francis has sent a message to the Italian news agency SIR (Servizio Informazione Relgiosa/Religious Information Service) in time for the thirtieth anniversary of its publication. The agency was founded in order to help better communicate information relating to both religious and world affairs to the Italian Catholic Church. Lion Air flight JT610 lost contact with ground officials 13 minutes after takeoff from Jakarta and crashed into the sea with 189 people on board. On Monday evening, the day after the Synod concluded, 6 women religious representing the International Union of Superiors General (UISG) met with women religious, ambassadors to the Holy See and journalists. They reflected on how women religious can make the Synod bear fruit in the lives of young people. Before the General Audience on Wednesday Pope Francis greeted a delegation from the American Bible Society in the Paul VI complex. Pope Francis says every Christian vocation, including the priesthood and consecrated virginity, are deeply spousal, life-giving and self-sacrificing. He was speaking at the General Audience during which he reflected on the 6th Commandment. Speaking to the pilgrims gathered in St. Peter’s Square for the Wednesday General Audience, Pope Francis reflected on the 6th Commandment, “You shall not commit adultery”, and said that as Christians, our “original call” is "to full and faithful spousal love", which Jesus Christ revealed and gave to us. Commenting on the Letter of St. Paul to the Ephesians, he described the concept as “revolutionary” saying that notwithstanding the “anthropology of the time” it affirms that “the husband must love his wife as Christ loves the Church”. And elaborating on this, the Pope explained that although the Commandment refers “explicitly to matrimonial fidelity”, it also speaks to every human relationship and vocation. The Pope said the development of human maturity follows the path of love that goes from receiving care to the ability to offer care, from receiving life to the ability to give life. On All Saints, Nov. 1, Pope Francis recited the midday ‘Angelus’ prayer with the faithful and tourists in Rome St. Peter’s Square. Pope Francis on Thursday urged Christians to seek holiness not by accomplishing extraordinary things but by following the path of the Beatitudes without half measures in everyday life. The Holy Father offered the exhortation before the midday “Angelus” prayer on All Saints Day, a holiday in Italy and the Vatican. Dominican archbishop praises the will of those involved to bring young people closer to Christ and his Church, the general mood of the meeting, and the contributions of the young auditors. Archbishop Anthony Fisher of Sydney, Australia, was on the information commission for October’s youth synod, and he was elected to the Ordinary Council of the Synod of Bishops, which will prepare the next assembly. In this Oct. 28 interview with Rome correspondent Edward Pentin, the Dominican archbishop praises the will of those involved to bring young people closer to Christ and his Church, the general mood of the meeting, and the contributions of the young auditors. But he also highlights what he sees as weaknesses, including a “disappointing” diffidence about the Church’s moral teaching, an unwillingness to provide translations, and that almost all of the synod fathers felt “shut down” from speaking after they had given their interventions (speeches). Pope Francis was the first Pontiff to go to the Laurentino cemetery, a 67-acre area in Rome’s southern periphery. The program included a stop at the children’s cemetery. The “Garden of Angels” is an area of 600 square meters dedicated to the burial of stillborn or aborted babies. Two marble statues of Angels, symbols of innocence and purity, guard the Garden. The Holy Father celebrated Mass in the Chapel of the Risen Jesus, which opened in 2012. Of a circular shape and a surface of 220 square meters, it has 140 seats and a 120 square-meter Plaza. The Cardinal Vicar of Rome, Camillo Ruini, consecrated the Laurentino cemetery on March 9, 2002. 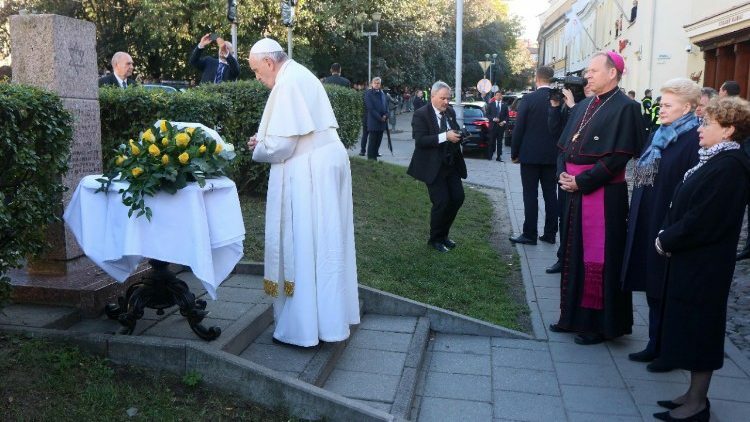 It’s the fourth cemetery visited by the Pontiff on the occasion of November 2: in 2013, 2014 and 2015, he celebrated Mass at the Verano cemetery. In 2016 he presided over the Eucharistic celebration at Prima Porta and in 2017 at the American cemetery of Nettuno, before pausing at the Fosses Ardeatine. The Dicastery for Laity, Family, and Life unveils a new body that will provide services to the international Catholic Charismatic Renewal which will be established on 8 December. The Holy See is establishing a body that will provide a “new, single, international service for the needs of the Catholic Charismatic Renewal in the Church”. This news was announced by the Dicastery for Laity, Family, and Life in a Press Release on 31 October. According to the Press Release, December 8 is the day that will see this new structure come to light. In addition, the statutes governing it will be approved, “ad experimentum” (i.e. on an experimental basis). Pope Francis himself has requested the creation of such an organization “on several occasions”, the Press Release states. CHARIS will be its name and it “will operate in favour of all expressions of the current of grace that is Catholic Charismatic Renewal”. In his homily the Pope reflects on the parable of the Ten Bridesmaids at the wedding banquet, and uses the image of oil to describe how we should live our lives. 8 Cardinals and a Patriarch passed away over the last year. And 154 Bishops from nearly 40 countries. All of them were remembered by Pope Francis at a Requiem Mass celebrated in St Peter’s Basilica, at the Altar of the Chair, on Saturday morning. During his Angelus address from St Peter’s Square, Pope Francis takes his cue from Sunday’s Gospel reading from Mark in which a scribe asks Jesus "What is the first of all the commandments? Pope Francis has warned that “rivalry and vainglory” have the power to destroy the very foundations of communities by sowing division and conflict. Speaking on Monday morning during the homily at Mass at the Casa Santa Marta, the Pope reflected on the Gospel reading of the day that reaffirms the importance of giving freely. The Pope began by recalling his most recent meeting with a Jewish community during his visit to Lithuania in September. That visit commemorated the Seventy Fifth anniversary of the destruction of the Jewish ghetto in the Lithuanian capital city, Vilnius. The Kingdom of God is often seen as a banquet. Jesus invites us to be with Him at the feast – but, the Pope asks, how often do we make up excuses in order to refuse His invitation? Jesus, Pope Francis says, is good, and offers us a second chance, but He is also just. The day’s Gospel passage revolves around a banquet organised by one of the leading Pharisees, to which Jesus had been invited. The Gospel for Monday told how, at the banquet, Jesus had healed a sick person, and had observed that many of the guests sought to occupy the most prominent place. The Lord told His host that he should invite the most needy to dine with him, those who could not return the favour. Continuing his catechesis on the Ten Commandments, Pope Francis at his General Audience on Wednesday focused on the Seventh Word: You shall not steal. Page created in 10.206 seconds with 19 queries.